Welcome to the Kids Zone on our blog! If you are looking for a creative and fun Christmas gift for your children (and something you can happily play with, too), check out these award-winning Rory's Story Cubes. 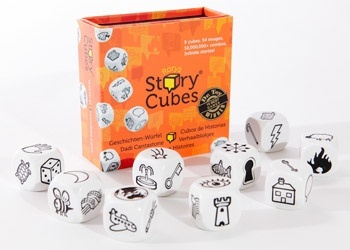 Here in London we had these wonderful story cubes delivered last weekend and we all loved them instantly, already spending hours taking turns to tell our own stories. Some are better then others, some funny, some sad, but these little cubes definitely encourage your child’s and your own imagination to go to all sorts of places in a matter of a dice throw. A truly amazing toy!